The only possible concern we might have with our cork floors is that, like hardwoods, they can scratch or gouge, if you aren't careful. In our old house, we had hardwoods with a dog, a baby/toddler and no protection on our furniture. Scratching and gouging were never a problem. Still, cork is pretty new to most people, and our installer made sure to warn us to be careful, especially when getting behind the frig. (Like I've ever cleaned behind the frig!) But, it got us thinking about what we can do. Our installer suggested we find furniture movers to put under the frig (and freezer in the pantry) to protect our cork floors and making moving these heavy pieces easy. We found Workforce Movealls Furniture Movers with Coveralls at Home Depot for $9. 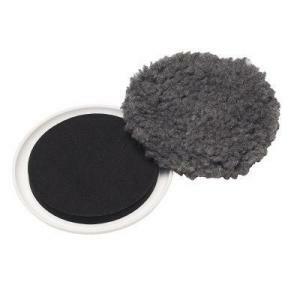 The fluffy earmuff looking part is for use with slick surfaces, like cork, hardwood, tile or linoleum. To move furniture over carpet, just use the little frisbee looking part. For $16 dollars (one pack each for the frig and freezer), our cork will be safe forever. Not a bad investment. The HomeDepot.com reviews were split, one person loved them, one person said they didn't work on marble floors (I'll never find out), and one person said they didn't work on carpet, but if they had the fluffy part on, they wouldn't. But, with only 2 stars on the site, I checked around the web and found this delightful endorsement: "go out and buy some, because no one wants a hernia!"